An interesting element appears now and again in the subway construction scans. Among the engineers, construction crews and machinery are some four-legged workers. Images of horses being utilized in the subway construction effort appear as late as 1926, and images of horse-powered transportation, including buggies and delivery wagons, are seen as late as 1931. When construction of the subway started in January, 1920, three contractors had been selected by the Rapid Transit Commission to complete the work: D.P. Foley General Contractors, Hickey Brothers and Fred R. Jones Company. The construction of the 16-mile subway loop was separated into nine sections, with contractors bidding for work on each section. 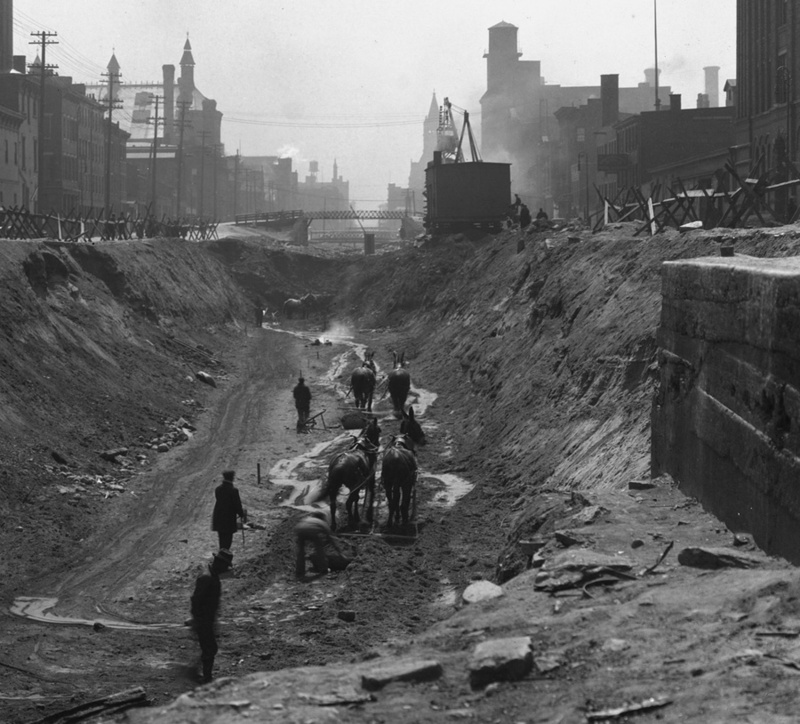 One section might include construction of tunnels within the old canal bed for underground subway tunnels and stations, while another section might require construction of tunnels through a hillside, above-ground station construction, or grading of terrain for tracks to be laid in the open. 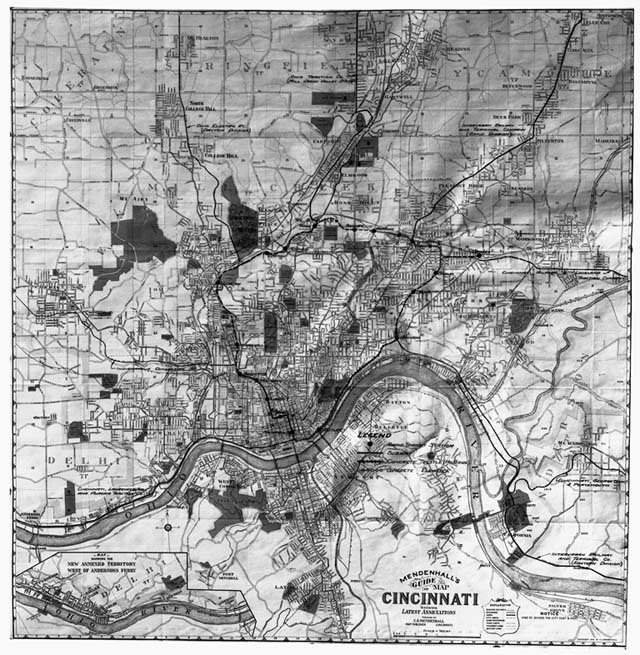 In order for Cincinnati to keep pace with other major cities at the turn of the 20th century, city leaders and citizens recognized that a rapid transit system was necessary for the successful growth and prosperity of Cincinnati. Although several electric street car and interurban railroad lines, as well as horse-drawn streetcars, were utilized for passenger transportation around the city, each line was separately owned and passengers were required to switch from one line to another to reach the downtown business district. A faster, more direct and more efficient means of reaching the downtown was needed. 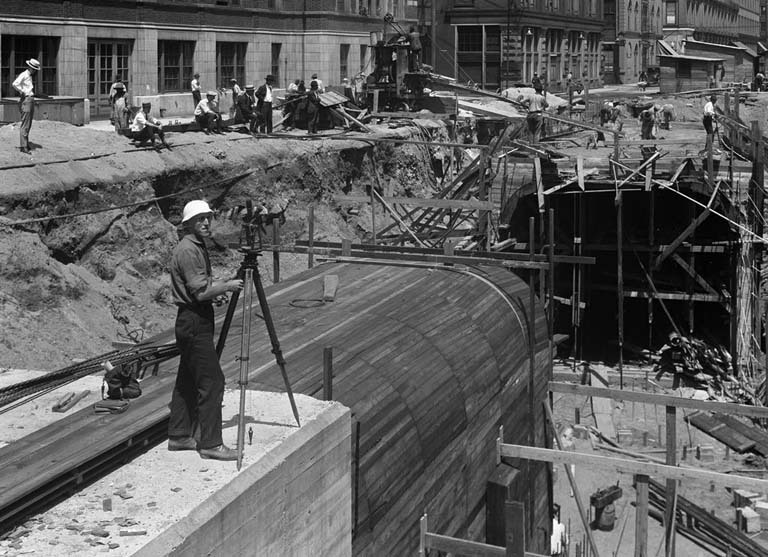 As I’ve mentioned in previous blogs, the collection’s photographer (whose identity continues to elude us) did not hesitate to include scenes of everyday life in his images that document the subway and street improvement projects. As he photographed the progress of the construction, which included images of the workers, engineers and commissioners in charge of the projects, he also captured the curiosity of the city surrounding these projects. In addition to the scenes of everyday life that are found in the photographs of Cincinnati’s subway and street improvement projects, our photographer also captured a glimpse at the consumer side of this growing city. Images of billboard advertisements, as well as shots of shops and markets, gas stations and factories are found within the photographs, providing a backdrop to the construction and repair work that were the intended subject matter. 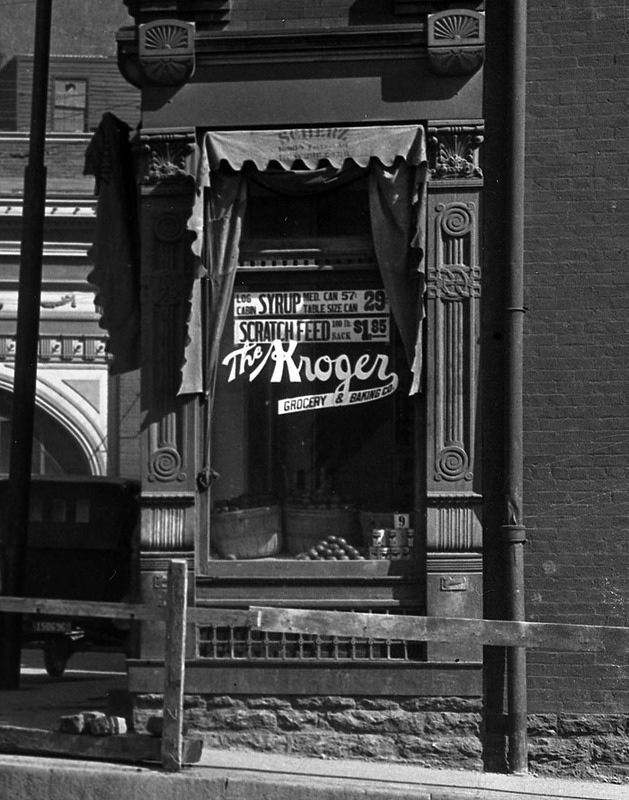 Found among the images of neighborhood drugstores and shops are shots of companies such as Cincinnati’s own The Kroger Company. 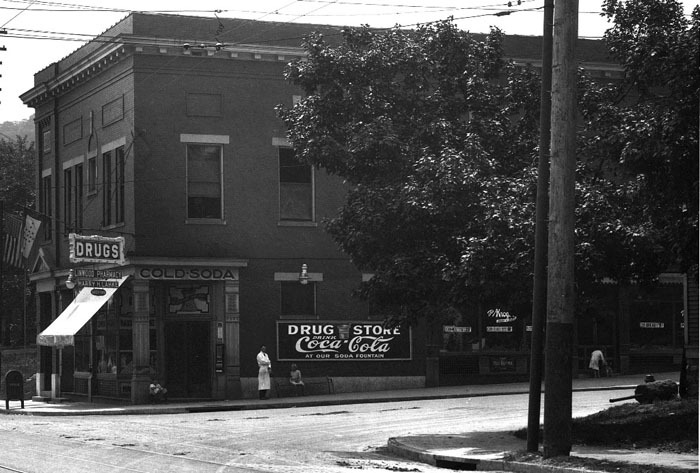 In the images below, early Kroger storefronts are seen, one located at the corner of Mohawk and Central Parkway, and the other (to the right of Linwood Drug Store) at the corner of Eastern and Linwood Avenues. 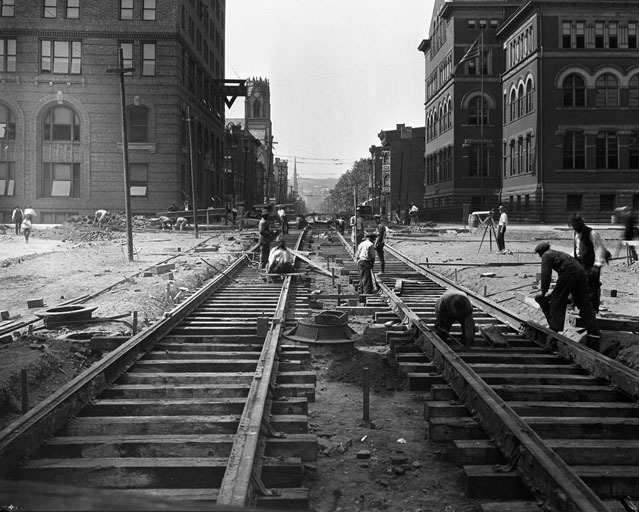 In the spring of 1916, the citizens of Cincinnati voted in favor of the $6 million bond issue approved by City Council for construction of the “Pearl Street Belt Line,” a rapid transit loop that was to provide a solution to the congested traffic patterns in-and-out of downtown Cincinnati at the turn of the 20th century. Sometimes, in order to build up you must tear down. Sometimes, progress comes with a price. 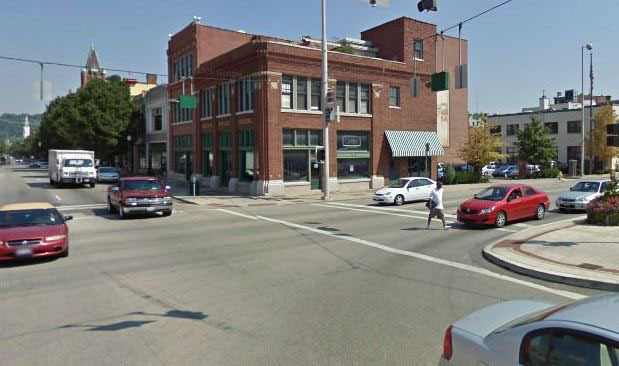 In the case of the Cincinnati subway construction project, that price was the removal of several homes and businesses located along the proposed subway route. The razing of these buildings was due in part to their location, some lay in the direct path of the subway route, but also due to structural damage caused by the construction process. 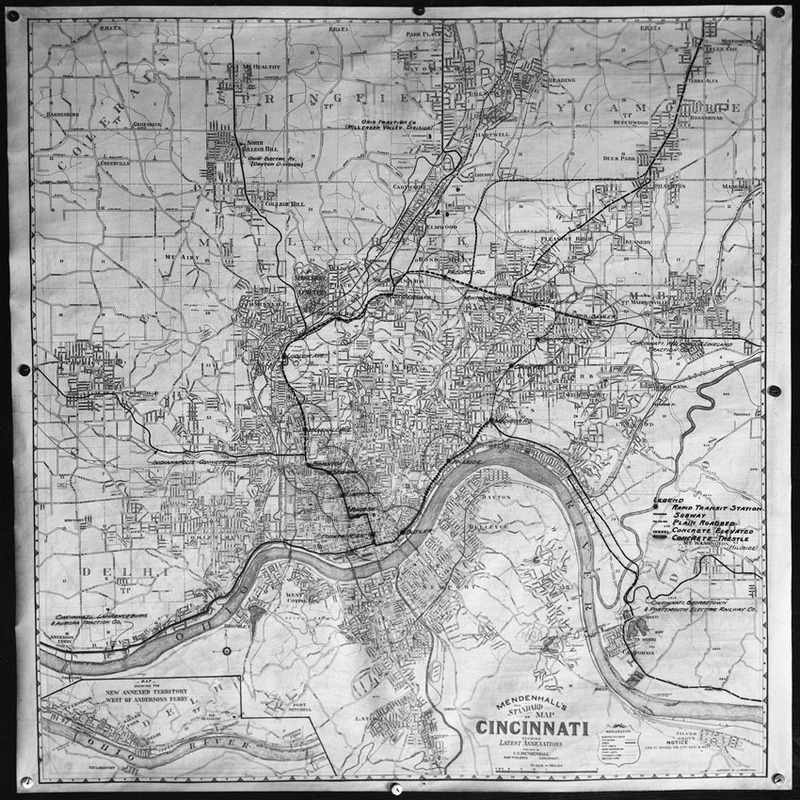 The Cincinnati (Ohio) City Engineer – Rapid Transit Records collection includes both negatives and prints of subway construction and street improvement projects conducted by the City of Cincinnati between 1917 and 1957. While we are fortunate to have over 2000 printed copies from negatives included in the collection, not every negative has a matching print, and the digitization project does not extend to producing archival prints of the negatives. Because the prints and negatives have been separated into folders, with the negative folders organized by date and the print folders organized by street name, it is quite a task to match a print with a negative. Reviewing the images of the subway construction has provided me with a great opportunity to learn the names of the streets and the different intersections around downtown Cincinnati that were major points along the subway route. As I learn to navigate my way around the city, driving from one location to another, I’m finding this very useful as I’m constantly recalling images and the navigational captions written on the negatives. By providing the street names and directional information for each image, the photographer gave us a map of 1920s Cincinnati. I thought it would be fun to show a “then and now” perspective of some of those streets and intersections, courtesy of Google maps, providing a snapshot of how much the city has grown and changed, starting with the removal of the canal in the 1920s. 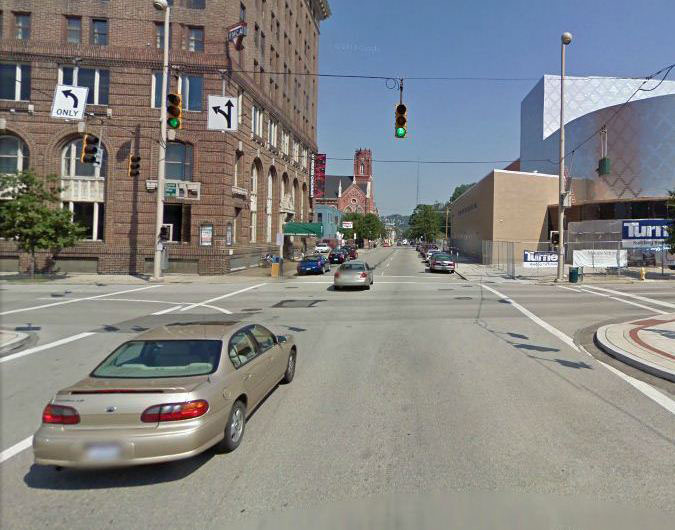 The images shown here begin at Race Street and head west along Central Parkway, then make a turn at Plum Street to head north on Central Parkway past Mohawk Place (The building on the corner of Central and Mohawk Robin Imaging, the company digitizing the collection. 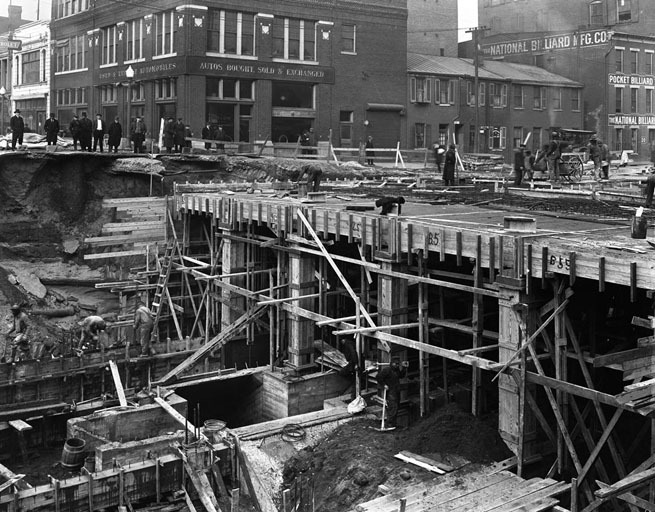 ), and north on McMicken Ave.
An immediate advantage gained by the digitization of the subway construction negatives is that one can now easily follow the progress being made on the project. 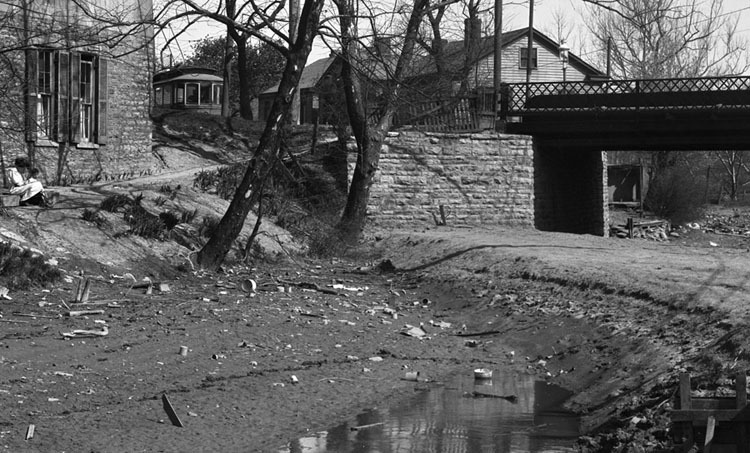 From images of the drained canal bed and the earliest scoops of dirt removed to shots of the broad parkway ready to receive pedestrian and automobile traffic, researchers accessing the images will be able to follow each step of the process, much like the crowds of curious onlookers who gathered daily to watch the event in the early 1920s. Once the collection is made available online, viewers may easily follow the construction process for each section of the proposed route, thanks to the photographer who carefully documented each image by writing the date, time, and location of each photograph directly on the negative itself. Such information is an invaluable historic record of the project, and of the city of Cincinnati, and will be captured in a database to make searching for specific images within the collection that much easier. Bad Behavior has blocked 400 access attempts in the last 7 days.